Hey, folks! Firstly, I’d like to say I’ll be a few days late on my Wednesday reviews because I’ll be off to Toronto for the evening. I apologize for any inconvenience this may or probably will not cause. Secondly, as promised, here is my lovely explanation of the CGC! I was fortunate enough to be able to deal with the CGC when I met Stan Lee in Toronto last August for Hobbystar’s FanExpo event. In a nutshell, it’s Canada’s version of ComicCon. 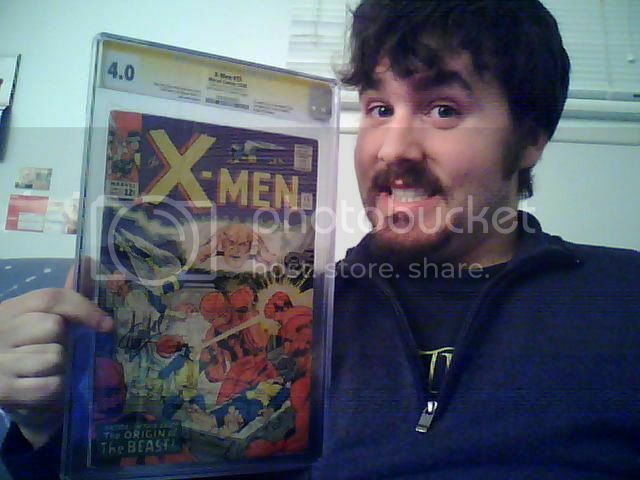 I was one of the first people in line to have something signed by Stan Lee – that being my copy of X-Men #15 from December of 1965. It was a dream come true – to meet my childhood idol AND to have him sign something he actually created. While in line, CGC had a sign there stating that they would be taking submissions for their signature series, since someone from CGC (actually it was someone who was licensed by the CGC, Desert Wind Comics) was actually present to witness the signing. Here’s where you ask, “Wait. How can you prove the book is signed? Why does it matter?” Enter the CGC. The Certified Guaranty Company, also known as the CGC, is a company dedicated to the grading, acting, consistency and commitment to comic books and their collectors. They are, by all means, the largest unofficial-official “authority” in comic book collecting. But more on that later. What does the CGC do? The CGC will grade your comic book with a scale from .5 to 10.0. To be fair, it also goes through three stages of grading. The Restoration Detection Expert, the Pre-Grader, and the Grading Finalizer. Hefty, eh? Each person does their own job and makes notes about the grading. Once all three graders have finished grading, they will “average” out the scores they give to make a final score. If there are disagreements, they will be discussed until a final answer is made. Have you ever been to a comic book store or a comic book convention and witnessed books in plastic with numbers above them? That’s totally CGC’s fault. But what do they mean? Let’s explain the label first. Here’s a CGC graded copy of Marvel Premiere #3 I pulled from the world wide web. Click on it for a larger view or open it in a new window. Firstly, notice the big 9.6 on the left. That is the grade which CGC gives the book for its quality. Following to the right, we see the book information. So Stan Lee and Barry Windsor-Smith both wrote it, followed by the artist, the cover, and so on. It varies per comic. In the middle, we have the name of the book, the date, and how it was printed. On the right of that, we will see if there is any relevance to the story at all. 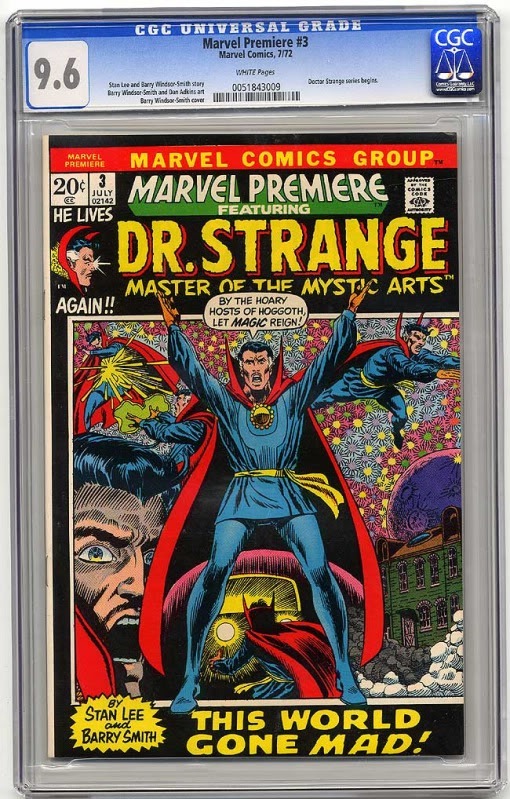 For this, we see that this is the first issue where “Doctor Strange series begins.” And off to the far-right, is a holo-foil CGC label. Simple enough. Blue (Universal): Much like that issue of Marvel Premiere #3 above, the colour blue is the most common of the gradings. 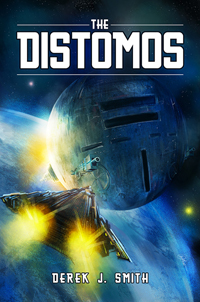 Blue means it is a standard book. Any book you would hand in, whether it be brand new or from the 30’s, will be given a blue label. Purple (Restored): This colour means the book has been restored in some way or another. It is noted how the quality of the restoration is done as well, where A is amateur and P is professional. Next to those, it will suggest if the restoration was slight, moderate, or extreme – telling how much restoration has been done. It will also say what was done underneath the date of the book. Green (Qualified): A green colour means there is a defect in the book which must be noted – under the date on the label. This comes into play where a signature may not be authenticated or a price sticker has been placed over the book. A book can still reach a high grade with a sticker on it, so it still does not hurt to get it graded. Yellow (Signature Series): This is something which I was lucky to get. It is simply a book which has been signed by one of its original creators, has not been restored, and the signature was witnessed by an employee of the CGC. One thing to note is that if the signature is by someone who did not write the book, it will still get a yellow tag – as long as the name is authenticated by a member of CGC. Unfortunately, that means comics you may have signed by legends like Jack Kirby or Joe Maneely, will never be able to be authenticated. Recording devices, testimonials, pictures, etc, do not count. Only CGC approved staff does. It will say when it was signed underneath the date the book was published. Yellow/Purple (Signature Series/Restored): I think this one is pretty self explanatory. Does it Change the Price? Some people like to collect comics without them “harmed,” regardless of the signature. Although, arguably, a proven-signed comic should be worth more, that does not always reflect how much someone will pay for it. For example, in my eyes, I could not put a value on that comic. If I did, it would be astronomical in price. This goes with absolutely every comic signed everywhere. As for the grading system, there is a rubric of it shown here at Comics Price Guide‘s first website. Their first website has a break down of the comics value with a general grading and its price, versus the CGC’s grading and its price. It’s neat to see how things fluctuate with particular comics. (Their second website removed the CGC pricing). Although they are known world-wide for their reviews, of course some may differ on opinions. Take for example a professionally restored comic with a purple label. Arguably, that would be the comic restored in its original form. However, to some, that would destroy the quality of the comic – much like a signature series would be looked at. Thusly, would a purple label diminish the comic quality for the owner? Then of course you have opinion. While the example of the Fantastic Four #5 is one, you may also consider that your comic quality is still better than what CGC grades it. I had a discussion with my local comic book shop owner, and we both agreed that it does boil down to opinion. Although they are “official,” they are still a self-titled grading company with professionals. Given all you have read here, I must ask you this: Do the CGC seem qualified or unqualified to be doing what they’re doing? As for some other general questions to think about, ask yourself: Does a signature, even by a comic great ruin the quality of the book? Are restored comics worth less, despite more money being put into them to make them better? Do CGC gradings make comic prices unfairly inflated? If there are any other questions you have, feel free to comment below. I’d love to generate some discussion based off of this. Also check out the CGC and Comics Price Guide websites off to the right of this blog for more information.